In the last edition, I was very worried about the lack of rainfall, but as soon as it published we recorded 180ml which has filled our dams up almost to the brim! 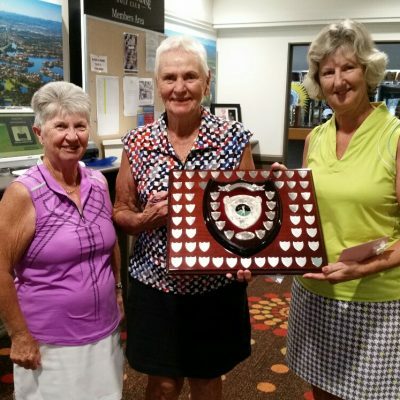 Well done to Pam on winning the employee of the year, it was a great night at Royal Pines and a just reward for her 35 years service at the Club. 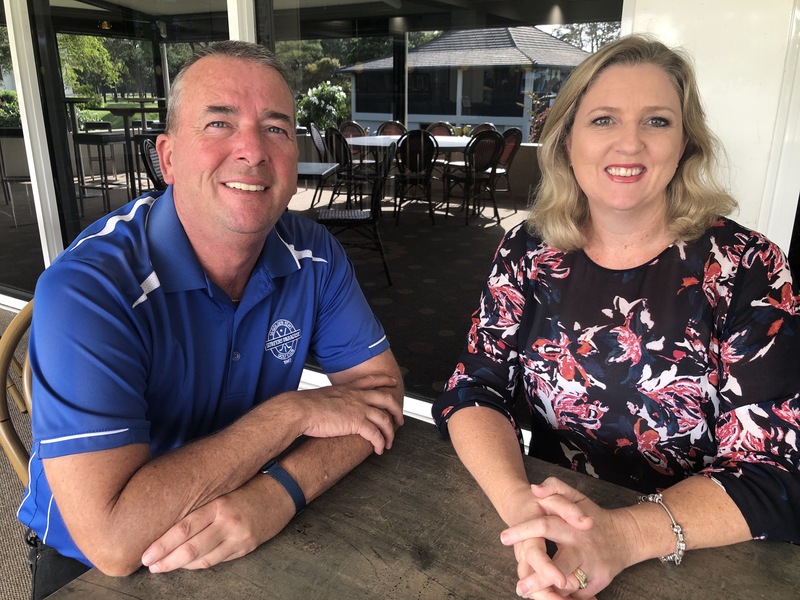 Our Club President Phil Murphy sent out a special member’s news recently on behalf of the Board about an information evening to be held at the Clubhouse on Tuesday 16th April at 5.30 which will discuss some proposed changes to the constitution, we hope you can attend in person. The new alfresco area has finally been completed and what a lovely upgrade to our facilities we now have, also thanks for all the positive feedback from our members hopefully this solid roof can whether any storms that now come our way. We will hope to be installing the lift to the function room from May; installation time will be around 14 weeks from planning to completion, but should not cause any issues for members accessing the Club during that time. 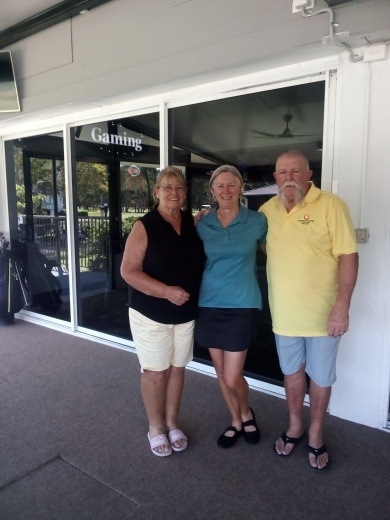 And finally well done to Di Potter for her very first hole in one which was on the tricky 16th hole on Tuesday, from eye witness accounts at the scene it was a fantastic high looping shot with just one bounce and in the hole! How long have you worked at SPGC? A TV host, working on a travel show. What’s your worst cooking mishap? Not really a cooking mishap, more of a drink mishap. I was making my daughter a chocolate milkshake. She loves chocolate, so I made sure I added heaps of what I thought was chocolate syrup, but was in-fact barbecue sauce. Which of course we discovered when she eagerly started drinking her yummy milkshake. What can I say, the milkshake came out as quickly as it when in! It wasn’t my best mum moment!! Do you like any sports? If so, which ones? And what teams? I am more interested in the arts, dancing, singing acting etc. 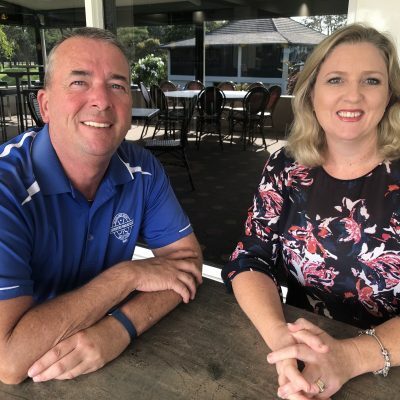 I don’t usually watch sports, well that’s not entirely true I do love watching my son play soccer on the weekends, so with that in mind, I would have to say yes I do, and my favourite team are the Burleigh Bulldogs. Who is the coolest celebrity you’ve ever met? What job did you have when you were at high school? Temple of the Emerald Buddha in Thailand, it was stunning, and very very old, completed in the 18th Century. It would be a thrill to see The Sistine Chapel in the Vatican City. Well the golf course continues to improve and so do the scores. None better than Colin Overy who had a brilliant 65 net to take out this years On Course Challenge “Gold Shirt”. A little birdie told me that he had one over on the back 9. Well done Col.
Club Championships are almost upon us as well. I’m thrilled to have the course in such good condition for our “MainEvent”. I hope everyone is having a little extra practice before they start. I’m sure everyone has noticed a few different tee placements over the past few weeks. I hope everyone is enjoying the “subtle” changes. I think it adds a little extra excitement each week and we can all thank Mark Careedy for his creativeness. Now that the greens are softer, please remember to repair your pitch marks. If you can’t find yours, tap down someone elses. Let’s keep these smooth putting surfaces nice for everyone. I love the Buzz around the clubhouse as well. It’s nice to see everyone smiling and happy about our course again. It would be great if a few more could stay for presentations as well. I’m very excited about the Masters. I believe that the greatest golfer of all time will win another Major this weekend. Go Tiger. Finally, please be advised that Surfers Master Cup scheduled for this Monday the 15th April has been cancelled due to a lack of competitors. 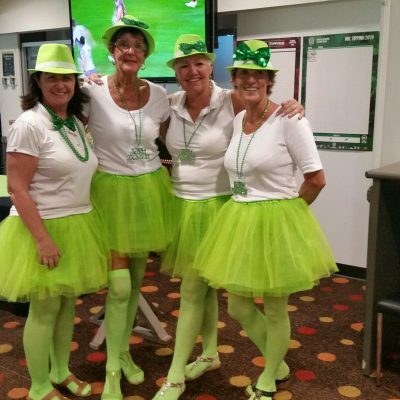 Hi members, another month rolls around and my favourite week of the year, Masters Week. 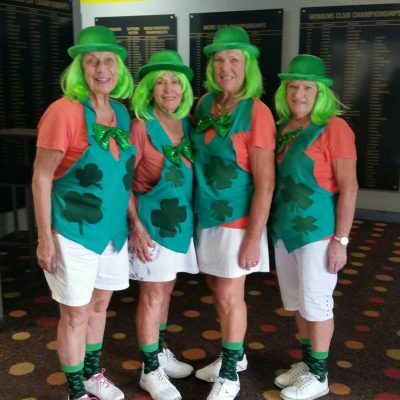 You just can’t beat watching the Masters. My watching started today with some old footage ‘’but masters footage’’. My tip, Marc Leishman and Cam Smith to give it a run. Lots of golf going on here at the moment. Our Oncourse Challenge Championship was run yesterday and well done to Colin Overy, winning with a great score of 65 nett. 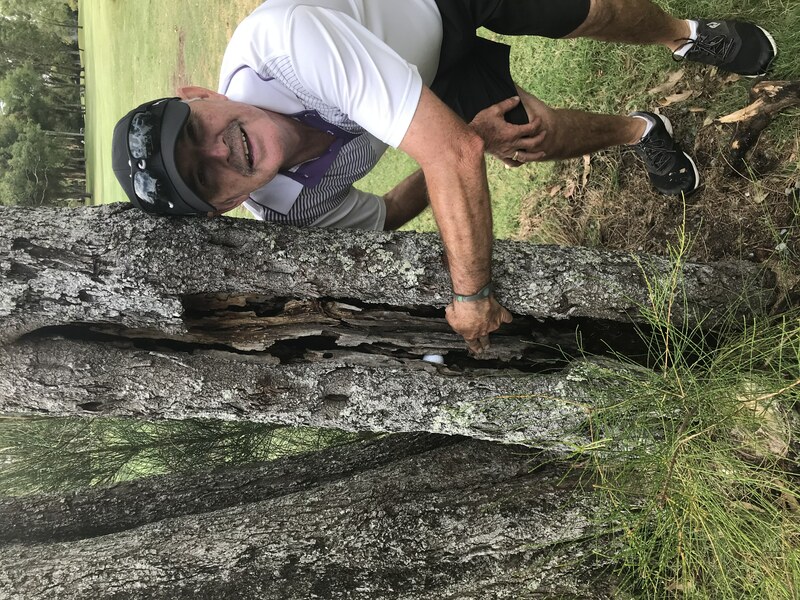 If you didn’t hear and I’m sure everyone did, Deyen Lawson blitzed the field in the Gold Coast Charity pro-am with amazing rounds of 64 and 66 at the Lakelands Golf Club. Deyen fly’s off to Morocco next week to re-join the European Tour. My round of the month goes to Kurt Clark who won last Saturday’s Monthly Medal with a fine 66 nett with his trusty new Callaway’s. Ali has increased her teaching times and is now available on Mondays Thursdays and Fridays. Book on the website or phone the shop, Her students are getting some great results. 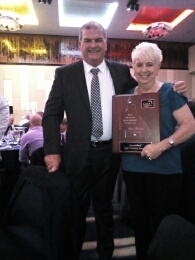 Our heartfelt congratulations go to Pam who has taken out “Employee of the Year” at the Queensland Golf Industry Awards night Thursday night, 21st March. 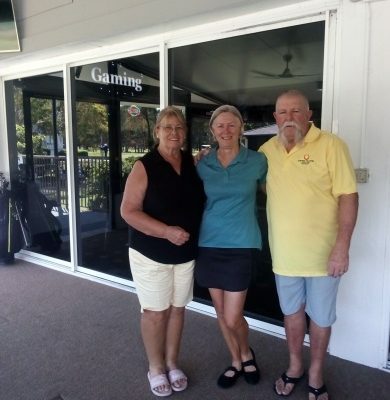 Pam works tirelessly for all Surfers Paradise members, has done so for 35 years and is the first friendly face our members and guests to the clubhouse see when they walk in the front door. Pam has obviously made a lasting impression on everyone and it is good to see her recognised in this way. Well done, Pam! 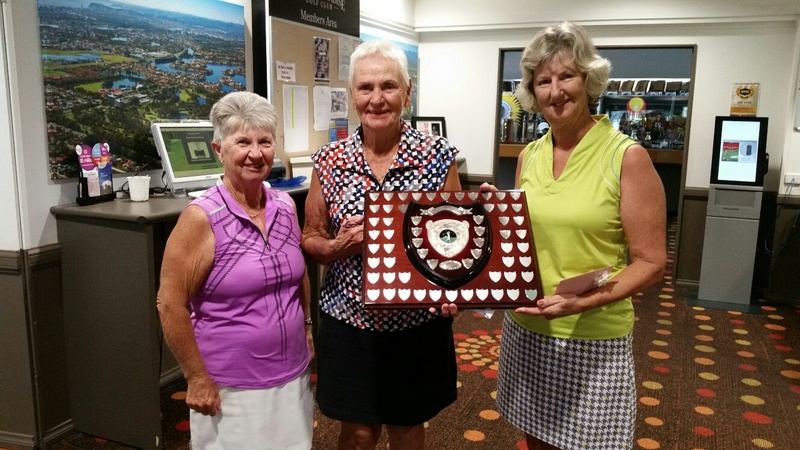 The Final Round of the Pam Rainger Memorial Shield was held in fair conditions on Thursday 28th March between Annette Gatland and June Hassum. Congratulations to June who defeated Annette 5/3. Well done to both June and Annette who fought through the previous 3 rounds to make it to the finals. The presentation of the Shield was made at the Thursday presentation of 4th April. Thank you to Marianne Ioannou and Lyn Daines for sponsoring this event. 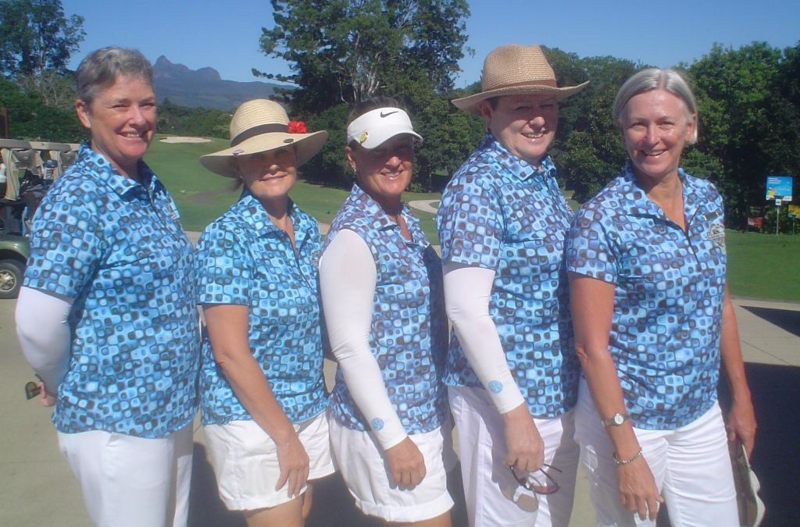 Congratulations to the Business Women’s Pennant team who played Round 6 at Parkwood against Parkwood with a team win 3:2. 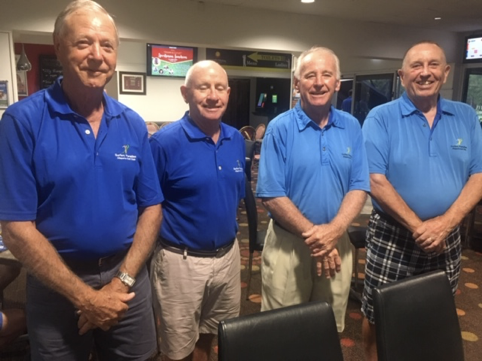 Surfers Paradise are currently sitting 5th on the ladder with the final round to be played this Sunday at Burleigh Heads Golf Club. 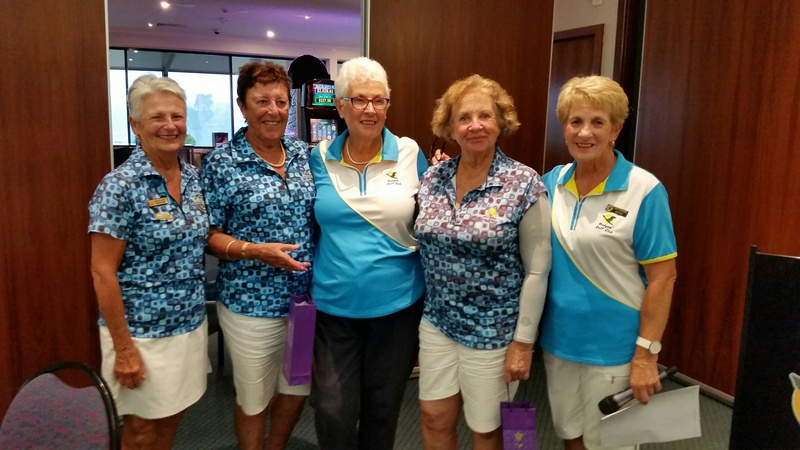 Nudgee Grudge Match – Monday 18th March – 33 ladies travelled by bus to play golf at Nudgee. 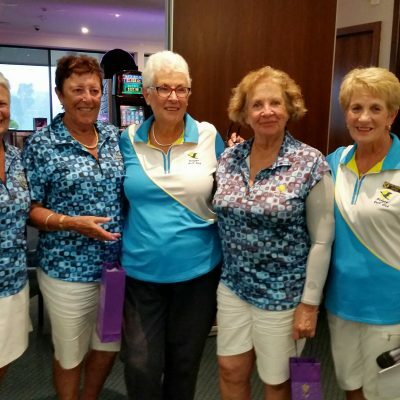 The weather was lovely, the course was dry and President Maureen and her committee did themselves proud with the scrumptious morning tea, champagne and lunch. 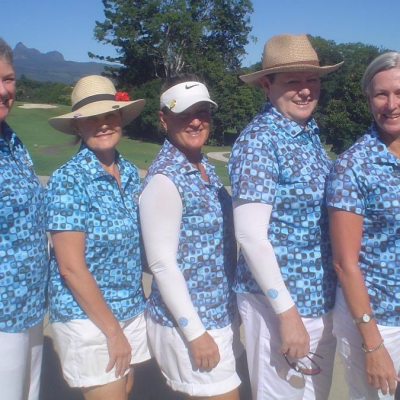 Congratulations to the Nudgee ladies who took out the trophy once again. 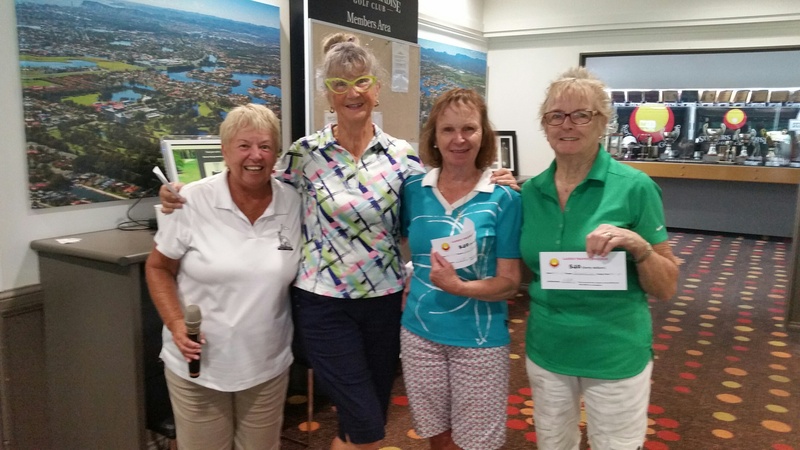 Congratulations to our Surfers winners Kay Campbell and Kaysie Sylvester with 36 points. 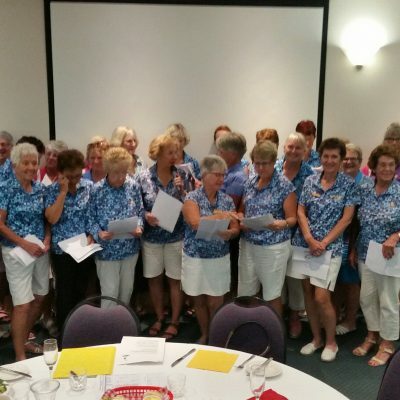 Well done to all the singers, joke and story tellers. A great day was had by all! 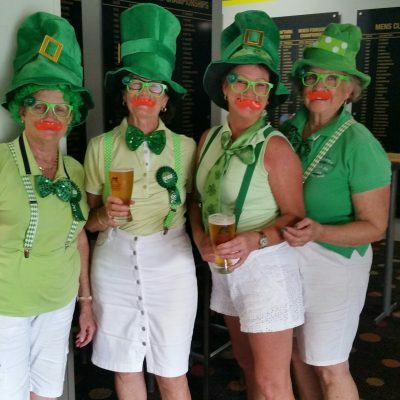 St Patrick’s Day Irish Fourball – Stableford Team of 4 – Thurs 14th March. 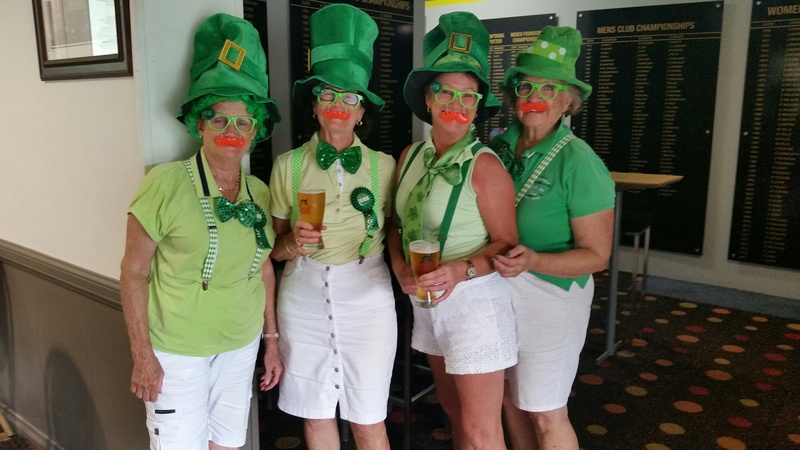 It was good to see 98 players turn out for St Patrick’s Day and to see so many dress up in the spirit of the day. 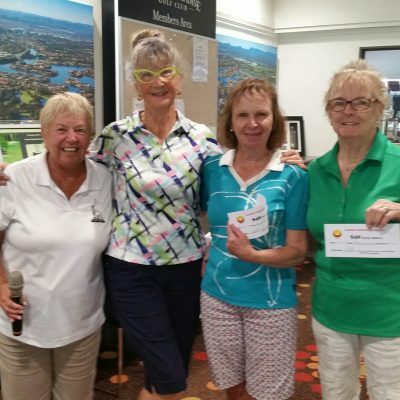 The winners on the day with a terrific score of 81 were Barbara Lush, Jennifer Armstrong-Klassan, Margaret Nasser and Sue Oakley. Congratulations girls. Hopefully you continue to see improvements around the Course as you play. We recently tidied up the garden area around the 16th tee. Plants were over growing onto the path causing some safety concerns, so they have been removed. Cocos palm removal is continuing which will create a substantial saving to the club from skip bin and removal costs. Volunteers are also continuing with mowing assistance. The Course is a picture at present, so enjoy it but also care for it by repairing both divot and pitch marks. 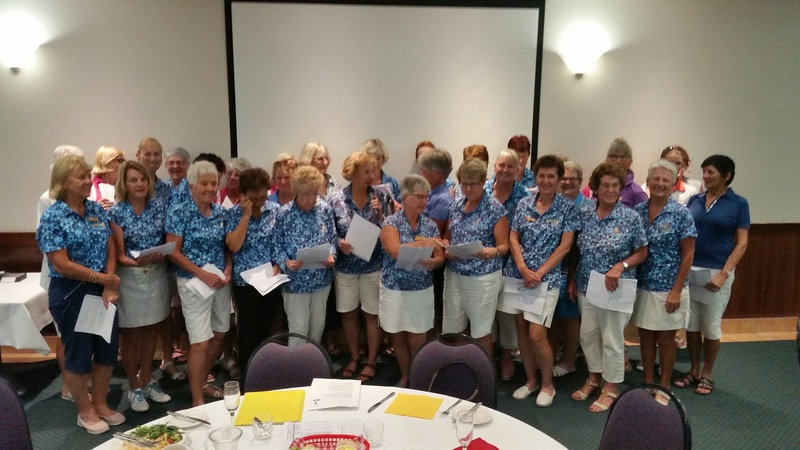 A Grade P Power, nett score 66. 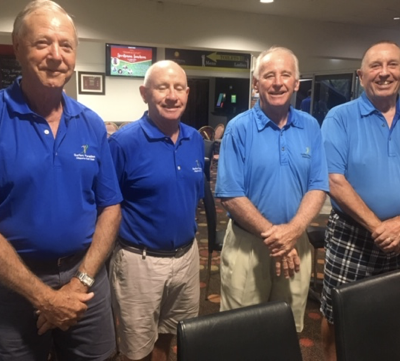 B Grade Joe Vella, nett 67. 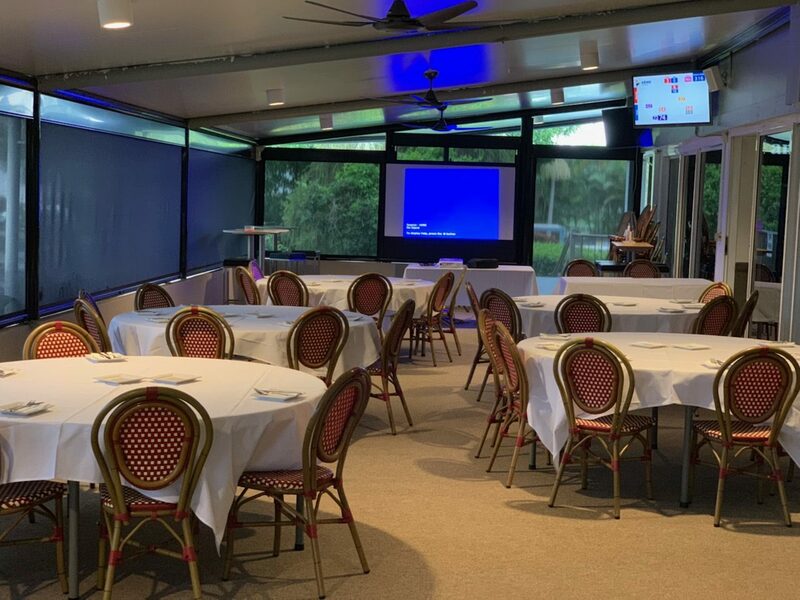 Our next awayday is scheduled for Tuesday May 28th, at Arundel Hills. this event will be generously subsidized. Always a very popular event, early booking is highly recommended. The new and improved club shirts have arrived and are selling like hot cakes. Some slightly embarrassed and greatly reluctant committee members , modeling the new (dark blue) in contrast to the old ( light blue).A bargain at $40 each. Sadly we Vale Brian Bayne , who recently passed away , a long time member of SPGC and a staunch supporter of Allsports. 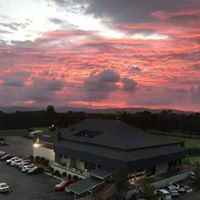 Entry 1 – Thanks to member Sandy for this beautiful picture of the club at sunset. Entry 2 – Thank you Graham Sandilands for sending this one in. 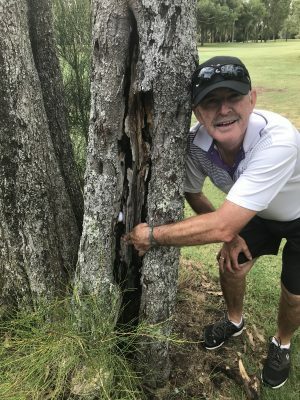 This is where Glen Ford’s ball ended up after his drive on the 4th. We knew it was close to the tree but not that close. 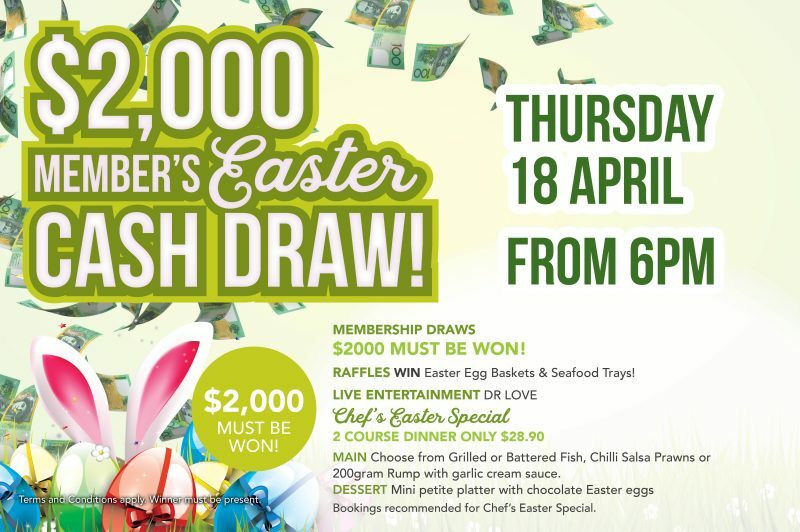 Sandy you have won a $30 bistro voucher, please drop in and see Pam at reception to pick up your prize. 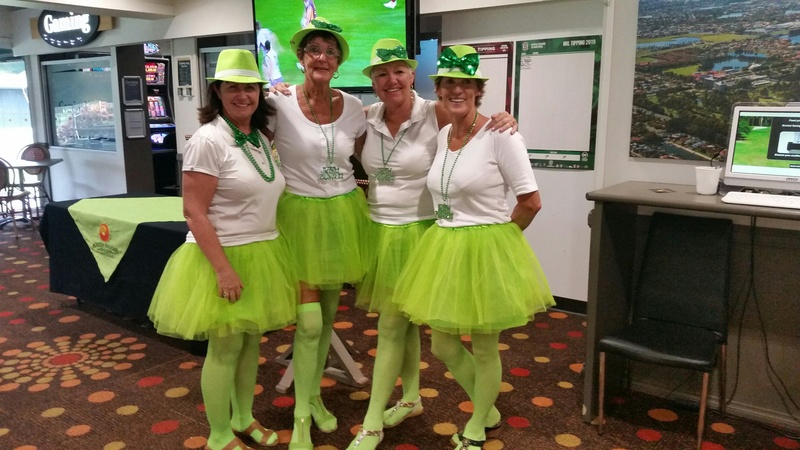 Members we love seeing all the fun you’re having out on course, so keep those photos coming. 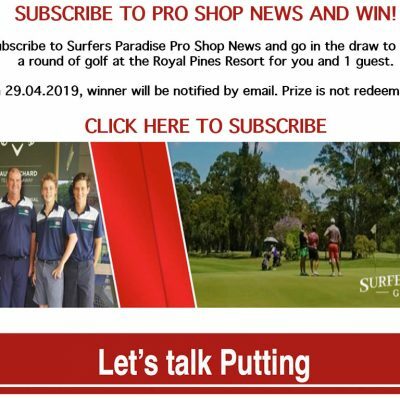 Please submit your images to functions@surfersgolf.com.au and don’t forget to add a caption. 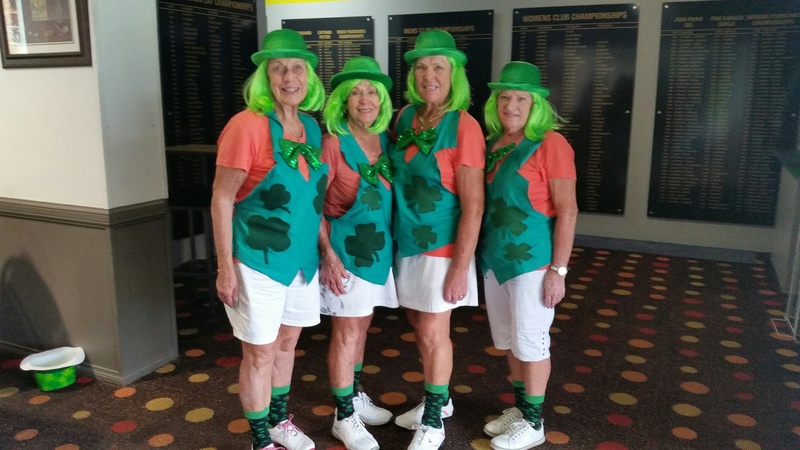 And don’t forget the Member who submits the winning photo will receive a $30 bistro voucher. Book your table at the bistro today to avoid disappointment. Click on the image below for all the details. If you love our club please spread the word! A google review is priceless to our business, and so easy to do. 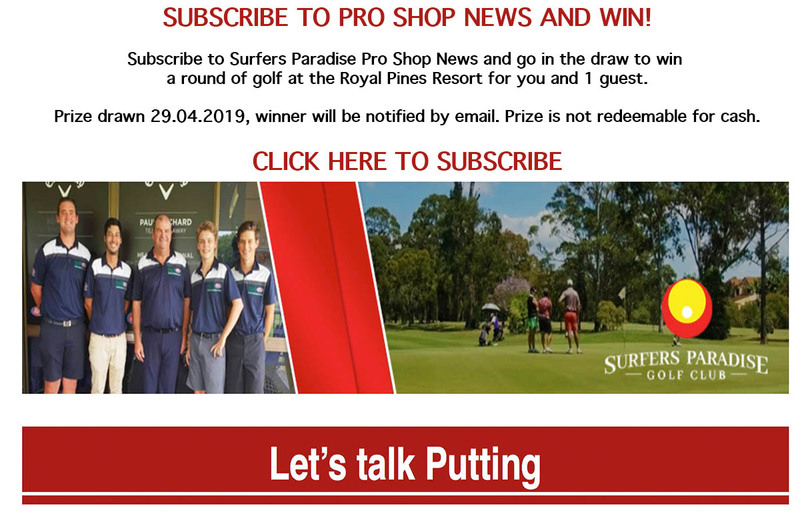 Simply go to google maps, search Surfers Paradise Golf Club. Click on reviews and leave a review.